The lowly lentil, a type of legume, has been sustaining man for thousands of years. However, some once considered lentils as poor man's food and refused to eat them because they are so inexpensive. Although they may be cheap, lentils are very nutritious, filling, and more importantly, arguably the most flavorful of all the legumes. Lentils, botanically-known as Lens culinaris esculenta, grow in pods that contain either one or two lentil seeds. Sometimes smaller than the tip of a pencil eraser, lentils can be round, oval, or heart-shaped disks. Known as dal or dahl in India, lentils are dried after harvesting and may be sold whole or split into halves, with the brown and green varieties being the best at retaining their shape after cooking. When halved, dried lentils resemble their split pea cousins. Thought to have originated in the Near East or Mediterranean area, lentils have been a source of sustenance for our ancestors since prehistoric times. They are the oldest pulse crop known to man and one of the earliest domesticated crops. The word lentil comes from the Latin lens, and indeed, this bean cousin is shaped like the double convex optic lens that took its name from the lentil. Lentil artifacts have been found on archeological digs on the banks of the Euphrates River dating back to 8,000 B.C. and there is evidence of the Egyptians, Romans, and Hebrews eating this legume. Lentils are also mentioned several times in the Bible; one example is in the book of Genesis and the story of Esau, who gave up his birthright for a bowl of crimson lentils and a loaf of bread. Depending on location, lentils were either considered a poor man's food or a delicacy for the upper class. While poor Catholics who could not afford fish during the season of Lent substituted lentils, lentils graced the tables of peasants and kings alike as a tasty and plentiful source of protein. In Greece, this legume was left for the less fortunate while in Egypt it was fed to royalty. 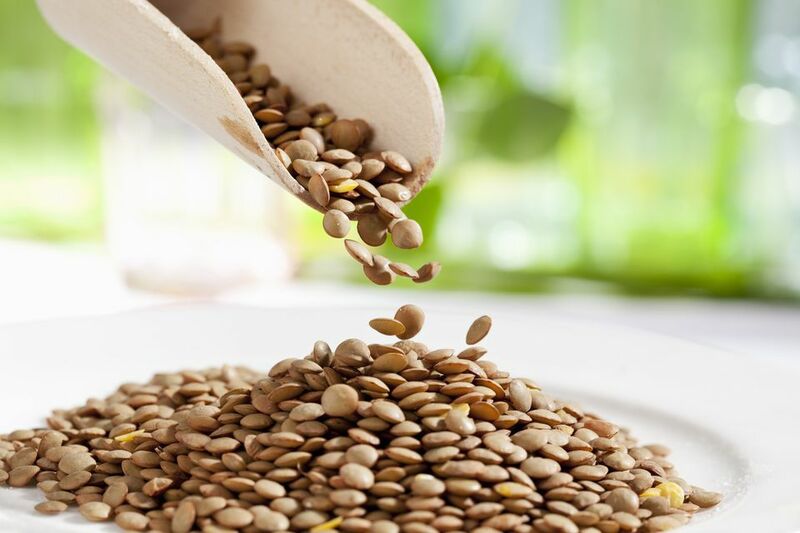 Today, however, lentils are a food for all, and have taken a prominent place among edible legumes, for both farmers as well as restaurant and home chefs. While other legumes have fallen off of menus, the lentil has risen in popularity. Agriculturally, lentils are a solid crop when drought is likely and the soil conditions are not favorable. In the kitchen, lentils are welcome for their ability to cook quickly, offer delicious flavor, and provide plenty of nutrients, such as protein, iron, and Vitamins A and B. There are hundreds of varieties of lentils, with as many as 50 or more cultivated for food. They come in a variety of colors, with red, brown, and green being the most popular. Lentils have an earthy, nutty flavor, and some varieties lend a slight peppery touch to the palate. Lentils grow best in cool weather. If you are growing your own lentils, sow them in spring as early as 2 to 3 weeks before the average last frost date. Most lentil production in North America takes place in the Pacific Northwest, Eastern Washington, Northern Idaho, and up into Western Canada, where it has been grown since the 1930s as a rotation crop with wheat.